When it comes to repairing damaged teeth and even replacing missing ones, dental crowns and bridges are two of the most commonly used restorations in all of dentistry. At Cochell Family Dentistry, Dr. Travis and Dr. Christel Cochell combine art and science to deliver custom-made solutions for some of the most common dental problems. A dental crown is a tooth-shaped “cap” that simply fits over the top of a compromised tooth that we have carefully prepared. With one, our dentists can repair a large cavity, put a broken tooth back together, stabilize a cracked tooth, and even cosmetically enhance a misshapen or undersized tooth. Bridges, on the other hand, are designed to fill in the gaps left by one or more missing teeth in a row. 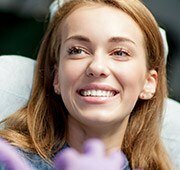 A prosthetic tooth is anchored in place using two crowns positioned on either side of the space in the teeth, and the end result is a stronger bite as well as a complete smile. If your teeth need a little help, crowns and bridges may be exactly what you’re looking for, so contact us today to schedule a restorative appointment. Afterward, you’ll be so glad you did!